​​​​CORPUS CHRISTI - Texas A&M University-Corpus Christi is closer to shortening a waiting list for student housing that's in the hundreds. The off-campus complex Momentum Village, that opened in 2015, was supposed to alleviate the growing demand, but it opened at 100 percent capacity. 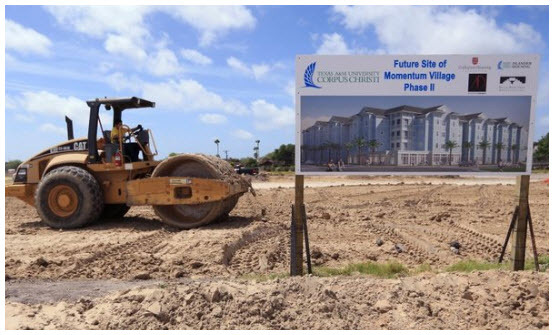 Phase II of Momentum Village will feature townhome- and apartment-style living and can accommodate about 560 beds. The complex will include two, four-story "L" shaped apartment buildings and three, three-story stand-alone townhome buildings. Preliminary numbers show the university will again break a record for the number of incoming freshman and total enrollment. The university's official 2015 fall student enrollment was 11,693 students. See more coverage of the groundbreaking​.